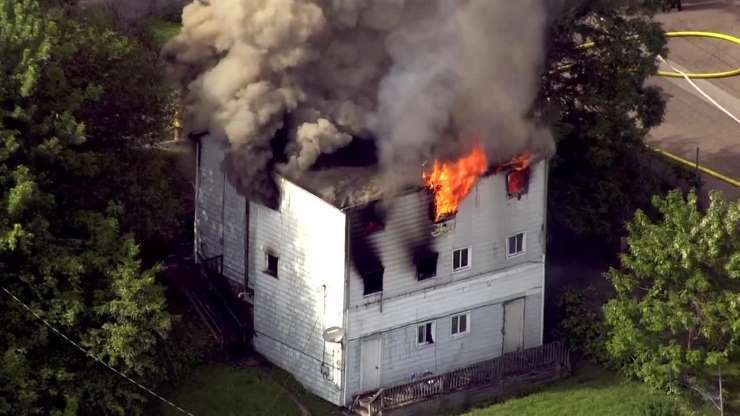 An 18-year-old firefighter with the Pioneer Hose Company is accused of setting fire to a home in Brackenridge, Pa., on Monday afternoon. Patrick Gillis is charged with arson and other offenses after the fire that destroyed a house on the 800 block of 7th Avenue, according to the criminal complaint. "I've taught him better than that," said Gillis' mother, Dana. "As a mom, when you do your best to make sure your kids don't make mistakes you make, and then this happens, I question myself. Where did I go wrong?" According to court paperwork, Patrick Gillis is suspected of setting the fire by putting his mother's lighter and some loose papers into a microwave in the home's kitchen and then turning on the microwave. Witnesses observed Patrick Gillis at the scene, and the Pioneer Hose chief later said the house was Gillis' former home, according to the complaint. Police said that upon questioning Gillis, he admitted setting the fire and told investigators he just wanted to respond to a fire. Dana Gillis disputed that account, saying her son only admitted to it because he was tired of being questioned by police. "I'm a mother. You're supposed to believe in your children," Dana Gillis said. "What mother or parent wouldn't believe in their child?" Patrick Gillis became a firefighter two years ago because he wanted to save lives, his mother said. In addition to working with the Pioneer Hose Company, Gillis is a junior firefighter with the Highland Hose Fire Company, an active member of the Salvation Army and a senior at Highlands High School. "When you look at it, and you hear that your own child has done this, it changes the whole outlook on things," Dana Gillis said. Patrick Gillis is scheduled to have a preliminary hearing May 30.